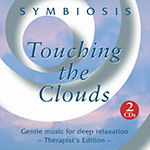 The group are best known for their relaxation album Touching the Clouds, which features the mellifluous flute-playing of John Hackett and has often been acclaimed for its proven therapeutic effects. Research at Kingston University found that it was the most successful music for reducing the heartbeat rate: and hence for reducing stress. Clive now hopes to introduce his group’s work to the many therapists and practitioners in the South West and to connect with like-minded musicians based in the area. 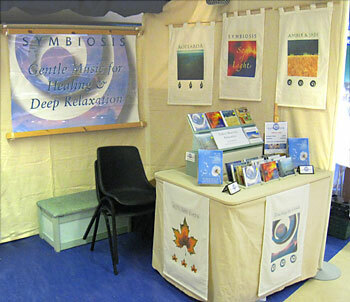 Find out more from www.symbiosis-music.com or call 01803 293030 for a free catalogue. 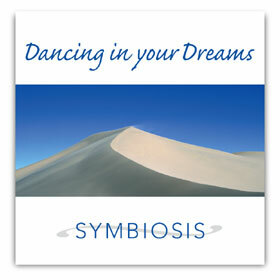 All Symbiosis CDs now only £9.95! All our albums are available now... just click here! Above: Interview with John Hackett & Clive Williamson from Channel One cable TV. Our Gallery and Broadcasts pages are now active! Lilting Latin rhythms; mysterious sounds from the rainforest; the magic of Moorish castles and joyful savannah journeys ~ Symbiosis connect with the pulse of the planet throughout this wonderful collection. Previously accaimed for relaxation albums like Touching the Clouds and Amber and Jade, at last the group celebrates its rhythmic side! Drawing inspiration from around the globe, Symbiosis have created a unique musical fusion which is by turns atmospheric, energizing and uplifting. Here for the first time is a compilation of their most rhythmic work, which features John Hackett (flutes); Richard Bolton (guitars); Ashley Drees (mandolin & percussion); and Clive Williamson (keyboards & wind synth). These gentle global grooves blend instruments and styles from Africa, Australia, Asia, Spain and South America. Kick off your shoes and enjoy this timeless music... hopefully you will soon be Dancing in your Dreams! Colour Meditations in music which are perfect for relaxation, visualisation and healing. Pure, powerful, and deeply relaxing, each track captures the quintessence of one colour in sound. The album features beautiful flutes, acoustic guitar and piano. The music on Sea of Light has been created to reflect the power of colour to affect and inspire our lives! 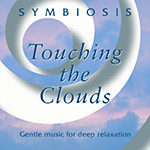 Here Symbiosis capture the essence and qualities of each colour in music, using deeply relaxing ambient soundscapes and natural instruments including flutes, acoustic guitar and piano. This is a unique journey in sound from rich, grounding Red to divine and meditative Violet, through the energy of Orange, the clarity of Yellow, the harmony of Green and the gentle and healing peace of Blue. The accompanying 12-page booklet includes original colour abstracts and written meditations for the seven rainbow colours. Use this album to bring colour and light into your life! Vibrant, serene and pure, Sea of Light is a harmonious and highly musical album. The two vibrations which can most profoundly and directly affect our emotions and our sense of well-being are colour and sound, and the music on this disc is an inspired combination of the two! Ideal for: Colour Therapy, Chakra Healing; Crystal Healing; Feng Shui; Space Clearing; Visualisation and Yoga; and for complementary therapies such as Aromatherapy, Massage, Reflexology & Reiki. Relaxation at home, at work, or while travelling. and now available on including a bonus 'flowing mix' of the entire album. Introducing Maloviere ~ not only an Actor, Character-Model and 'Look-Alike', but also a Musician, Composer, Poet, Calligrapher, Astrologer and English-Tutor living in London. He is always immaculately attired in the style of a true English gentleman, and brings the same precision and perfectionism to everything he undertakes, from speaking and writing to acting and modelling. 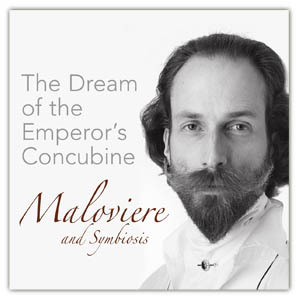 As a musician, Maloviere has performed live and recorded with the group Symbiosis, appearing on their relaxation-album Touching the Clouds (on the track 'Rivers of the Sun') and on their global-rhythms collection Dancing in Your Dreams (on a tune called 'Sesamum Seed & Rice'), both of which can be auditioned or downloaded worldwide through iTunes. For his first album-release, entitled The Dream of the Emperor's Concubine, Maloviere presents a retrospective collection of his thoughtful Balkan- and Eastern-European-influenced tunes, both as a solo performer and in collaboration with Symbiosis producer Clive Williamson on keyboards, flute and percussion; Richard Bolton on acoustic guitar and Ashley Drees on cittern and percussion. Maloviere plays violin; sopranino, soprano, alto & tenor recorders; balalaika; domra; and a delicate Russian steel-strung dulcimer called a tsimbala. The Dream of the Emperor's Concubine; Sea Dawn; The Dance of the Mountain-God; Rivers of the Sun; The Call of the Mountain-Shepherd; The Way Over the Hills; Caught in the Casbah; Two Breton Dances (Live) - Musette de Cabrette & Bourdon de Bombarde; Christmas Eve in the Village. OUT NOW: 18 melodic pieces composed by John Hackett, following on from his duo album "Sketches of Satie" with Steve Hackett and "Velvet Afternoon" with pianist Sally Goodworth. Here John plays both flute and guitar, joined by brother Steve and classical guitarist Chris Glassfield. "This album is a kind of homecoming as the guitar kindled my first love of music"
"John is best known for his superb flute-playing on albums by guitarist Steve Hackett and by our group, Symbiosis. 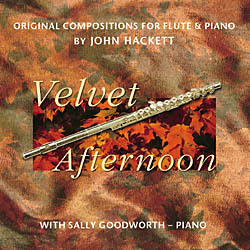 His latest recording is an album of his own compositions for flute and piano, featuring the pianist Sally Goodworth. Velvet Afternoon is inspired by the music of Erik Satie and other influential classical composers and is richly melodic. The style is distinctly classical but the emphasis is on good tunes with a relaxing contemporary feel. 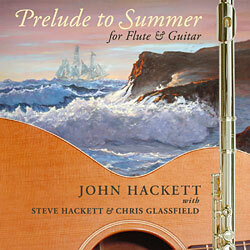 Following on from the success of Sketches of Satie, where John and his brother Steve beautifully re-interpreted Erik Satie's piano works on flute and guitar, John Hackett now proves that he is a gifted composer in his own right. The combination of John's flute-playing and Sally Goodworth's mellifluous piano accompaniment makes this the perfect album to relax to." 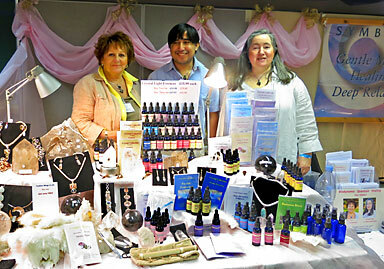 Address: Symbiosis, 14 Ash Hill Road, Torquay, Devon, TQ1 3HZ, England. Please note that in addition to our new PayPal On-Line Store, we still accept payments by cheque! - Simply download an order form and post it to us with your cheque or postal order!